Dayton Speedway held a one only race meeting in 1933, a year prior to its official opening meeting. Dayton Speedway officially opened as a 5/8th mile D shaped flat track on the 3rd of June 1934, reports claim that the track was a copy of the Legion Ascott Speedway. Not long after opening the track was banked for more speed and a 1/2 mile track was added. 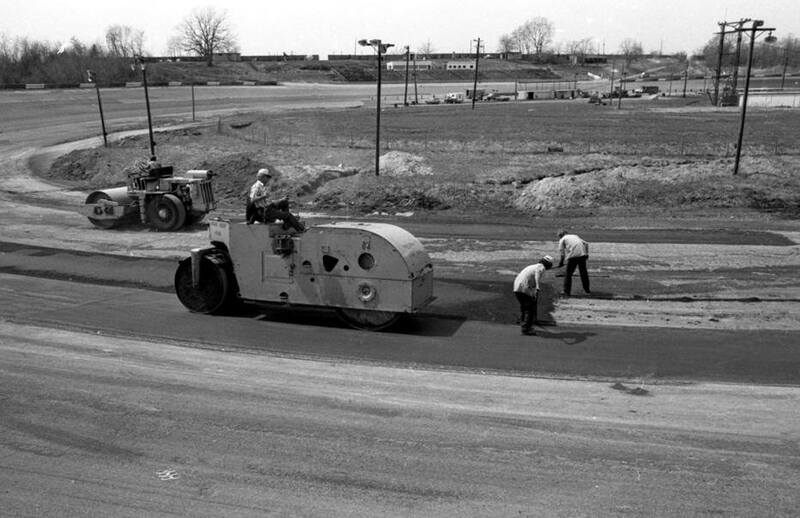 Paul Ackerman was the speedways manager through 1934 to 1936, On the 4th of June 1936 the track was repaved with asphalt. In 1937 Frank Funk took over as manager of the speedway. The track was converted to a high banked 1/2 mile dirt oval in 1939, the banking on the track was increased another 2 times after that. World War 2 ended racing at the track, like many others in 1941, Racing re-commenced at Dayton Speedway in 1946. In 1946 major upgrades as in lighting and an asphalt surface were added, With the opening meeting held on the29th of June 1946. 1948 - 3 times AAA racing champion Ted Horn in the number 1 racecar won both big car races that year at Dayton, He would later loose his life at DeQuion, Illinois in the fall. Photo: Ray Peterson. 1949 - Photo: Ray Peterson. 1950 - Duane Carter leads a heat race line up away at Dayton Speedway. Photo: Ray Peterson. 1952 - Photo: Skip Peterson collection. 1952 - Gordon Reid lost his life in an accident when his hit the grand stands, killing three spectators and injuring many more. Photo: Skip Peterson collection. 1953 - Note the old oval section of the original track behind the back straight. Photo: Skip Peterson collection. 1954 - Mike Nazaruk in the number 3 Mutt Anderson car on the pole line, Don Freeland in number 4, on outside Gene Force 74, Eddie Sachs in 25, Pat O'Conner in number 1, Larry Crockett in 31 and Charlie Engle's. Photo: Ray Peterson. 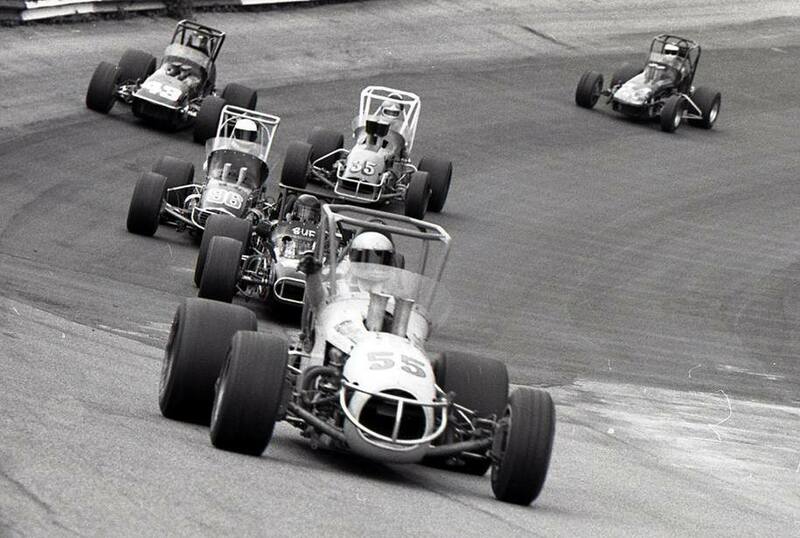 1969 - Sonny Ates 93 leads, Larry Dickson in the number 1 car, Al Smith in 26 machine from Scratch Daniels in the number 8 car. Photo: Skip Peterson collection. 1969 - Mickey Shaw number 76 lands on top of Karl Busson in turn 1 during a USAC sprintcar feature race, Larry Dickson on the inside went on to win the race. Photo: Skip Peterson collection. 1969 - Larry Dickson in the number 1 car passes Sonny Ates for the lead. Photo: Skip Peterson collection. The venue was closed to the public in 1971 and the track was used for testing only, The track remained closed through to 1974. The speedway re-opened in 1975 under new ownership, A totally new grandstand was a feature for the new season. The venue once again closed to the public in 1976 and the track was used for testing only. The track remained closed until 1978. 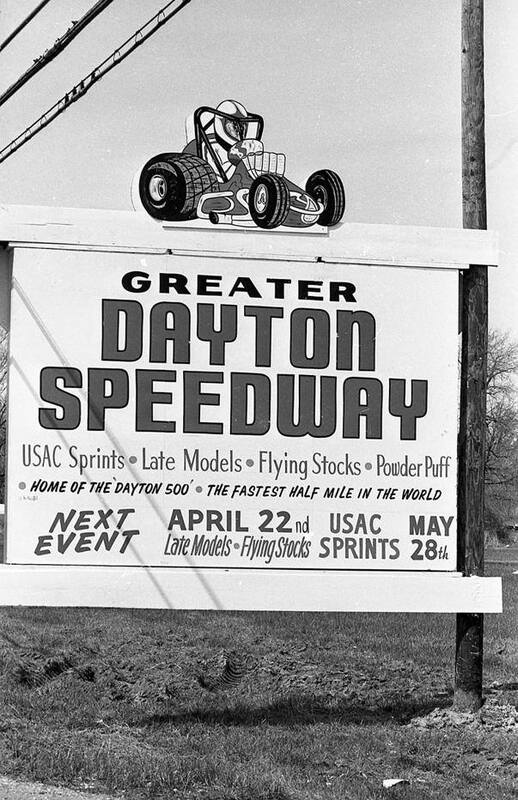 Don Thompson took over the running of venue in 1979 when the track was re-sealed and opened once again for competition, running under the name of Greater Dayton Speedway. Painting the pit observers stand. Photo: Skip Peterson. 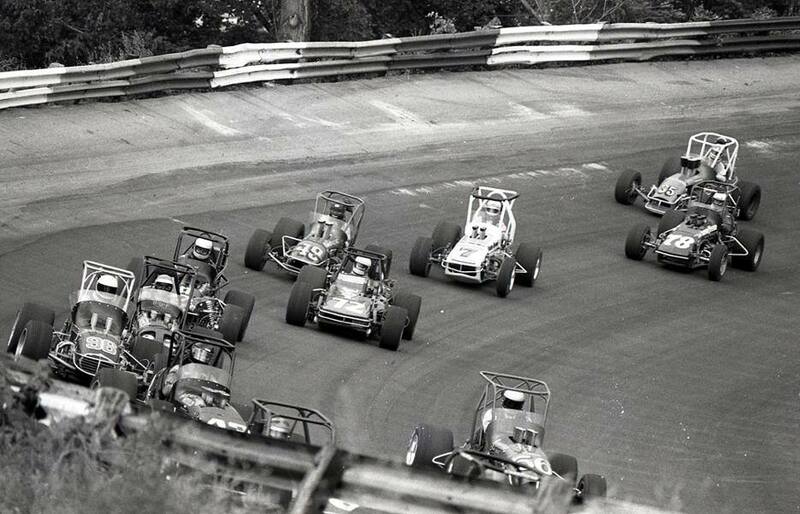 1979 - USAC Sprintcars battle for position at Dayton on the 1st of July meeting. Photo: Skip Peterson. 1979 - Rich Vogler number 55 leads the field during a caution flag of the USAC Sprintcar feature on the 1st of July, Vogler went on to win the event. Photo: Skip Peterson collection. 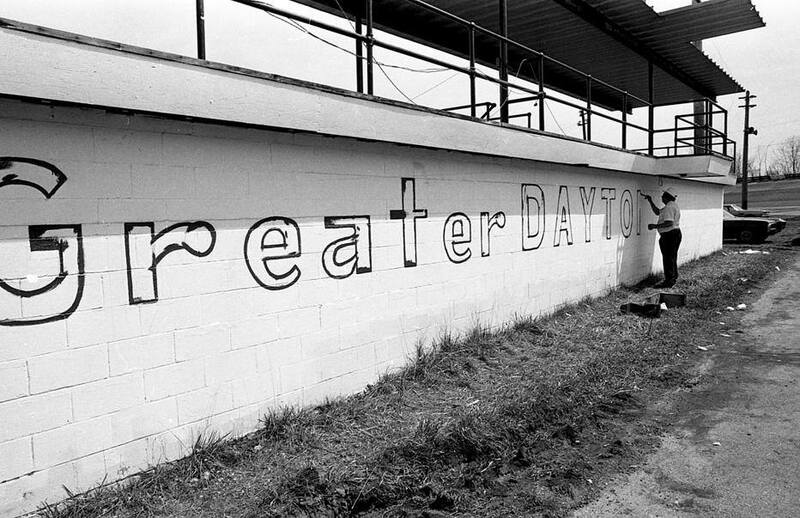 The venue closed at the end of the 1982 season for the last time, due to no liability insurance, The site became a land fill site and later sealed over with clay.